The Acer H7850 is a 4K UHD 3000 lumen projector, allowing it to deliver over 8.3 million pixels and a billion colours for a truly immersive viewing experience. With 3000 lumens and the deep blacks, subtle shading and brighter whites of 4K, the H7850 even provides cinematic quality images in daylight conditions. The projector adjusts to brighter scenes so the detailed highlights shine brighter, while in darker scenes, rich blacks are preserved and details typically hidden in the shadows are enhanced. 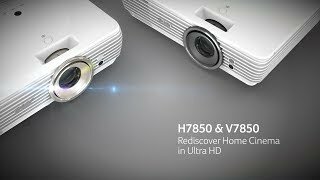 Thanks to its vertical lens shift technology and 1.6X zoom ratio the H7850 also allows you to find your ideal viewing size without moving the projector itself. With AcuMotion technology the H7850 even improves the frame rate of fast-moving scenes to eradicate motion blur, ideal for big-screen sports, movies and gaming. Being HDR compatible also makes the H7850 a perfect pairing for a 4K Blu-Ray player, getting the best possible picture quality from your system for that real-life immersion quality. Thanks to Home Series projector bulbs, which in economy mode last up to 5,000 hours, you can also enjoy over 2,000 films during the bulb's lifetime. This projector also includes Acer’s ExtremeECO power-saving feature that can reduce power consumption by up to 70% and extend lamp life by up to 15,000 hours.